The Royal Kami, the old master kami who makes khukuris for the king of Nepal and his top ranked cohorts came to shop 2 and made me a "royal" khukuri. He was puttering around shop 2 for 15 days. I asked his name and Kami Sherpa said, "I don't know. His nickname is Bura (meaning "old man") and that's what we call him. I guess Bura is five-foot-two or three and weighs maybe 115 pounds but he can swing a mean hammer and he knows how and where to hit hot steel. He's good. He knows more and thinks better than anybody in the shop which I suppose is why he's foreman. It may surprise some to learn that he has three wives and children by all of them. Maybe that's why he shows up for work everyday. But come to think of it if I had three wives I'd not be able to show up for work -- ever. Bura is about 45 and has 35 years experience as a kami. He lives in Swayambu and commutes to work via bus -- about a one hour journey each way. Lucky for Bura, I guess, he has a very short walk to the bus. Same from BirGorkha. Bus stop is only five or ten minute walk. He gets to work about six AM and leaves about 6 PM. He is very steady and a no nonsense guy. 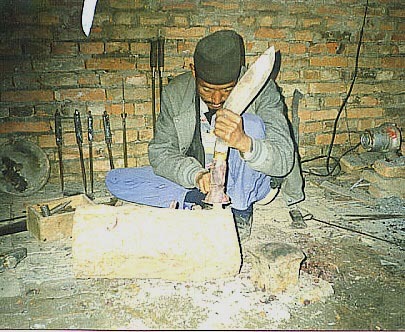 He comes to work to make khukuris, not to smoke cigarettes and drink tea. 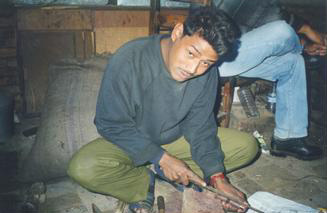 He is not our top producer but he makes the best khukuris in BirGorkha and perhaps in Nepal. 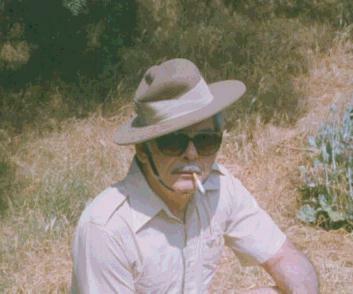 Bura smokes as do most of the kamis. 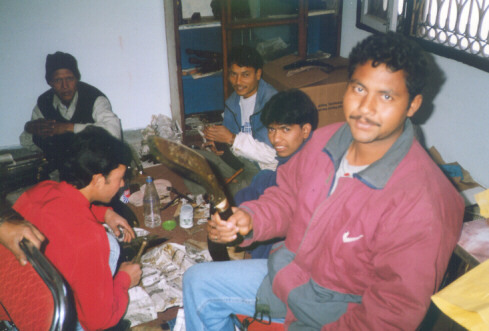 I bought all the shop people a pack of Khukuri cigarettes several times each week while I was there. Got my first taste of Bura, the Taskmaster, my first five minutes at BirGorkha. As soon as Gelbu and I walked into the shop Bura raked Gelbu over the coals because Gelbu had not alerted the shop to my upcoming visit. What Bura told Gelbu was essentially this and you'll have to forgive the language but this is the way he talks as do most kamis -- gets the point across: You rotten little ba*tard. Here's the man who sells our khukuris and sends us our money and you brought him here without allowing us to give him the proper greeting he deserves. Get out of here you little a***hole and bring Bill Sahib back tomorrow and we will have the shop and ourselves prepared. Because you have no manners you bring disgrace on all of us. You must remember that Gelbu is the boss, too, so you can imagine how Bura talks to his helpers. Bura was sort of the leader of the prayer movement when I was in the hospital and for that I extend great thanks to him and all the others who followed suit. The day I left I appointed the Royal Kami to the position of shop foreman. He is the best kami we have and is an old man who knows much. Further, he is a good man and will be able to offer a lot of help and good advice to my son, Gelbu, who still has a lot to learn. I instructed Gelbu to listen to him closely and follow his good advice. 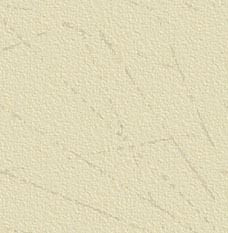 Last night when we spoke with Gelbu I found out his name. It is Lal Bahadur Bishwakarma but everybody will still call him "Bura", including me, and he is the nephew of Ganga Ram Bishwakarma who is in charge of making the Ganga Ram specials. Being the Royal Kami has honour but the work is far from steady. The king and his top aides only need a few khukuris. Now Bura will have steady work and if the king wants a khukuri made we will simply do it in shop 2. Perhaps we have accidentally become the Royal Arun ("shop")! After recovering in hospital from a blood clot in the brain, Bura is back making khukuris. He may not be able to swing the hammer but so what. In a lot of shops here in the US the hammer swinging is done by a machine. He's using helpers to do the heavy work but he's overseeing everything. I just got in a couple of M43s and some other stuff with his mark and it's Bura work for sure. The secret to success is knowing when to pull the steel from the forge and telling the helper where to hit. Then knowing when to pull the knife from the forge and how to pour the water. Bura did not like to use helpers but I guess when you have no choice you do what you have to do. I am not at all surprised. I knew Bura would not give up and would find a way. If you had not done this thing I think I would be dead so your great gift has given me more life than perhaps I deserve and for this there is not enough thanks in the world. I remember you all in my daily puja and when we do Bishwakarma puja we pray for all of you. This is the best I can do to repay you. Blessings to all of you and a special thanks from me and my family from the bottom of our hearts. Gelbu, the most educated and medically knowledgeable in the family, says he is almost certain Bura suffered a stroke -- for whatever that's worth. Bura went for checkup a day or two back and doc says he's doing fine but is facing meds for the rest of his life. Med clots meds, I'm sure. I think Bura is going to be hard to kill. All in all not such bad news. Thanks again to all who helped from Pala, Bura, Bura's family, and me. Kesar was the first kami Pala (=Kami Sherpa) hired. He'd heard Pala was opening a new "high tech" shop and was looking for top kamis and would pay top wages for same. He showed up, made a couple of example khukuris and Pala put him on contract. That's how all the kamis are paid. No salary. They are independent contractors and paid for the work produced. Bonus for exceptional work. Kesar almost never misses work and does very good work. He's a good steady producer. Additionally, he's a nice pleasant guy and easy to get along with. Now, here's one (or perhaps many depending on your point of view) of the reasons Kesar shows up for work and produces on a very steady basis. 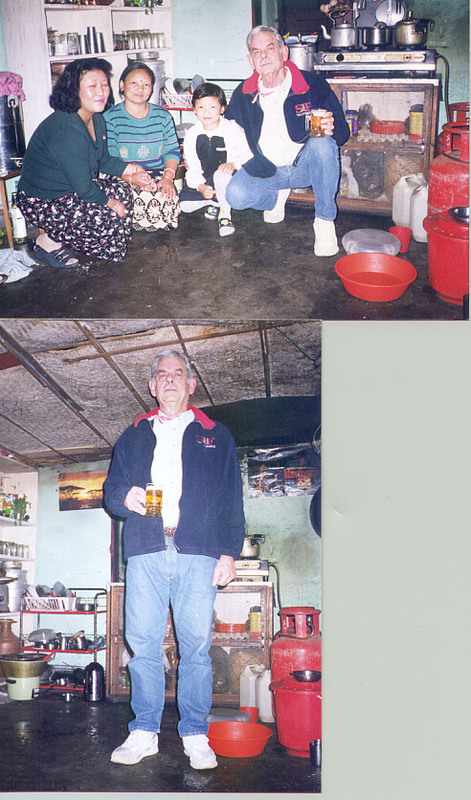 At his small home he has living with him TWO wives, TWO mothers in law, mother, maybe ten kids and a couple of nephews, nieces, and may a cousin or two -- 20 people in all. And it's his earnings at BirGorkha plus the few vegetables they can grow and the dozen or so chickens they keep that feed them all. He's GOT to be old reliable or those 20 folks will go hungry. I know it looks crazy to us but 'Nepal ho'. More power to him -- I guess. Sanu has been with us for awhile. Gelbu recruited him on an early recruiting journey to various villages. The story goes like this. Gelbu ran across Sanu is some small village -- don't know the name, and Sanu was having a hard time of it. Unlike many kamis he owned no land and was living in a small rented mud hut and had his shop located outside in the dirt. He is perhaps 35 or 40, married with a couple of kids. He had only a couple of khukuris in stock and was out of steel and other supplies. Gelbu looked at the khukuris and they were pretty good so he bought them. Sanu complained that he had not had enough work to meet expenses and he had been forced to borrow 10,000 rupia just to stay alive. He did not have enough money left to buy food or steel so he was mightily pleased to receive payment for the last two khukuris he had in stock. I think these two khukuris came in our first shipment of village models so somebody out there has them but I don't know who. During their conversation Sanu discovered that we were just getting shop 2 on the air and asked for a job. Gelbu told him to come along and return with him and speak with Pala. Sanu readily agreed. 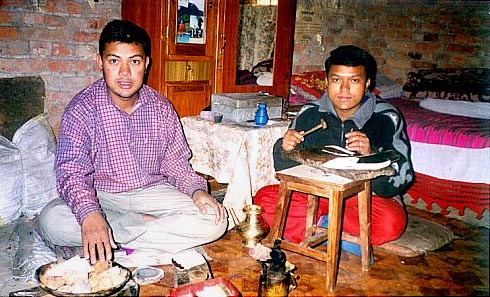 Upon his arrival in Kathmandu Sanu told Pala his story and asked for work. To his great credit Pala gave Sanu 15,000 rupees and told Sanu to return to his village, pay his debts, load up his wife and kids and return to Kathmandu for work. And to the great credit of Sanu he did exactly as he was told. He has worked very hard and just before Pala left for the US Sanu repaid the last of the 15,000 rupia Pala had loaned him. There are three very important considerations here. The first is the great trust and generosity shown by Pala. One of the "benefits" I mentioned offered by shop 2 that are unheard of in other shops. Remembering that the per capita income in Nepal is about US$150 per year the amount Pala loaned Sanu was more than US$200 or well above the per capita income. In the US the equivalent would be perhaps US$20,000. The second consideration is the fact that Sanu repaid the loan quickly -- in about three months. He is a man of honour and integrity and I am proud to have such a man working in shop 2. He has earned my admiration and respect. And, third, and something that is very near and dear to my own heart is that by working at shop 2 and doing a good job Sanu made enough money to repay the loan in three months. He was taking good care of his family and was still able to put aside 5,000 per month for loan payment. Boys, I have been there and I can tell you from personal experience that Sanu is making BIG money for a kami and God bless him. 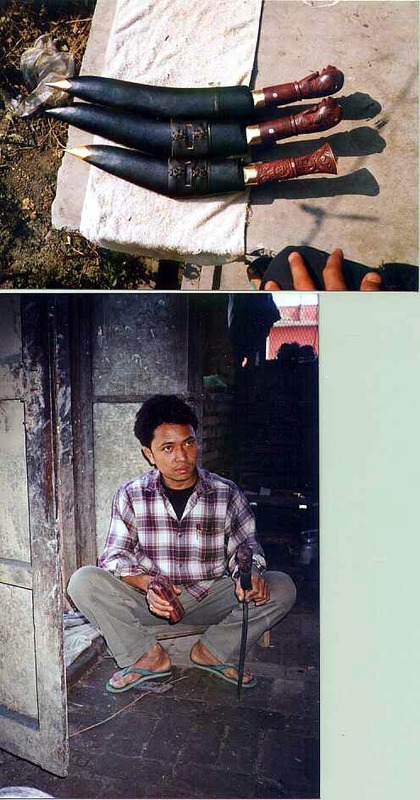 Here is Kumar Bishwakarma, maker of the Kumar Kobra. As you can see he is a young man but is coming on very strong and is producing some unique and very good khukuris. He does not have his wristwatch yet but one is on the way to him. Of some interest is the fact that Kumar is wearing eye protection while using the grinder. The Himalayan Imports shop is one of a very, very few to offer eye protection goggles for its workers so they tell me. Also, notice the old bicycle chain driven grinder setting idle against the wall. Our backup system in case of prolonged power loss. The young boy who is visiting the shop is the son of HI kami Kesar Bishwakarma who makes many of our standard items. What a name. The surprise was this is Kumar's older brother. Sher had been working in another shop for maybe 15 years but when Kumar told him about the pay and working conditions at BirGorkha Sher quit his old job and signed on with HI. If he does all his work as he does the kagas katnes we have another top quality journeyman kami. Kumar is one of our best and I figure his big brother has to be just as good or better due to his experience. When I got our first kagas katnes I was impressed with just how well they were done. As you can see from the reviews of this little knife others have been equally impressed. I wondered which kami made these because I thought his work was exceptional. All those kagas katnes were made by Sher Bahadur Bishwakarma. Sher is about 30 and has about 17 years experience. Here he is showing off one of his 18 inch Ang Kholas. Sher makes the biggest, beefiest, strongest khukuris of any kami in the shop. 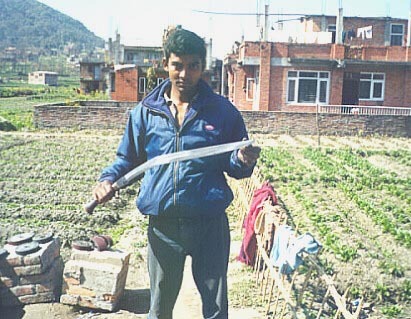 His younger brother, Kumar, likes to make long, slender blades -- just the opposite. Both men are excellent kamis and excellent workers. When they come to BirGorkha they come to work, not to chat and drink tea. They are both good producers. This picture was taken in the shipping room. 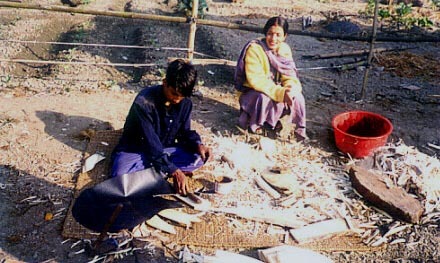 In the background you see Pradeep, mama [='(maternal) uncle'], Bhimsen, and an apprentice preparing khukuris for shipping. Like most kamis, Sher is the oldest son of a kami family. 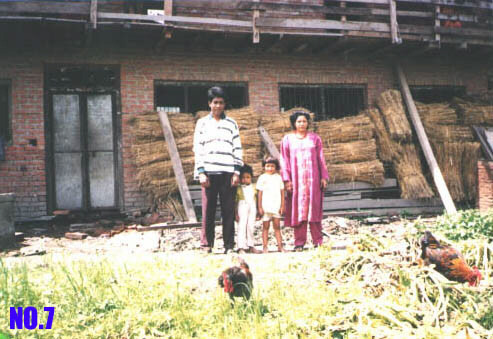 Home is down in the Dharan area. I'd guess he's 25 or 30. Kumar who worked for us for some time is his younger brother. They are both good kamis and excellent producers, primarily because they know how to utilize apprentices quite well. Sher is a no nonsense type of guy but little brother Kumar was a jokester and cutup which got him in trouble on a regular basis. The two did not get along well. As oldest son Sher will get all or at least the lion's share of the family property so he leaves from time to time to work on the farm trying to keep it in the best shape he can. Prakash is the nephew of 'Bura' (the Royal Kami). 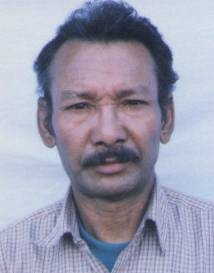 He left BirGorkha in February 2000 and seems to have returned in May 2002. He may be back to make a few bucks to finance a new girlfriend or may be back for awhile. Who knows? As soom recall he was the Casanova of the kamis -- three wives, lost track of kids, several serious girlfriends and many not so serious. Prakash was a good solid kami who did good work. His fit and finish sometimes left a little to be desired but he made a good stout khukuri that almost never failed. His problem was in dependability. He was too handsome for his own good. Some girl would make eyes at him and he wouldn't show up for work for 3 or 4 days. 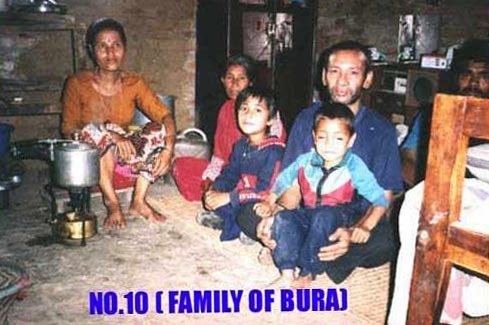 This is Murali Dhar Bishwakarma with wife and two kids. They tell me he is about 40 with almost 30 years experience. His mark is the trisul and he seems good about marking the khukuris he makes. The work he has done so far is very solid and shows experience and care. As some old timers may recall Murali was a good kami who worked at BirGorkha until he came down with TB and had to quit and return to his village. Well, he's back thanks to Pala and the BirGorkha health care system. Pala routinely sent money to Murali which allowed him to get treatment for the TB. Thanks to decent care, meds and Pala now Murali is up and running again and we'll soon be seeing some of his good work again. No biographical information or photograph available. I am Kami Sherpa. I have almost 70 years experience with khukuris. I have lived all my life in Nepal except for a few years when I lived mostly in India while I was serving as a Gorkha Rifleman in the Indian Army. I served in the Indian Army, Assam Rifles, 4th Battalion, Company C from 1952 to 1957. I was a rifleman. I believe you call the rank a Lance Corporal here. I was assigned to mostly border duty with Pakistan and Bangladesh. I did some duty in the Kashmir. I intended to make a career of Gorkha service but family hardship caused me to leave the service before I wanted. I am lucky in that I never had to kill anybody but I had to chase many along the border with my khukuri. I have eight children living. My wife, Dali, died much too young with heart disease. I never remarried and raised the children by myself. I have had a khukuri in my hand for almost 70 years. As children it was our responsibility to gather wood for our fires so you learn to use the khukuri at a very early age. 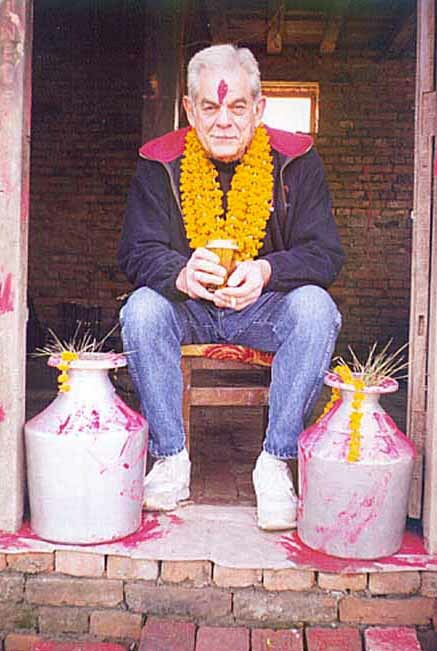 My neighbour, Kancha Kami, was the kami who made khukuris for all the people in our valley and even beyond. 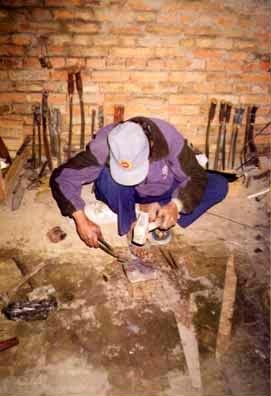 He was a very fine kami and I learned much about the manufacture of khukuris from him. He was older than me and has now left his body. He made some khukuris for us when we were first getting started as Himalayan Imports but sadly neither Bill Jwai nor I have one of these and now it is too late to ever get another. 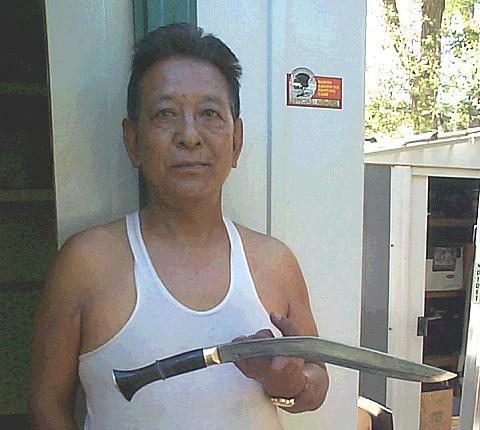 My father-in-law, Kami Sherpa, is not a kami though he can make a very nice handle for a khukuri but lacks the skill to forge a decent blade. He was named Kami for the following reason:-- the Sherpas believe that the Angel of Death has a quota to satisfy and this includes newborns. It is believed the Angel will pass over those of lower caste so they named their son "Kami", hoping the Angel would think he was indeed a kami of the lowest caste and not take him to fulfill the death quota. BILL: About 20 years ago after having been a student of Oriental religion for some time I decided it was time for me to travel to the part of the world that could provide me with some teachings straight from the horse's mouth, so to speak. I decided to go to Nepal. But, I got to thinking. Here I am, an American, from the richest country in the world, going to Nepal, one of the poorest countries in the world, to try to get something from them. 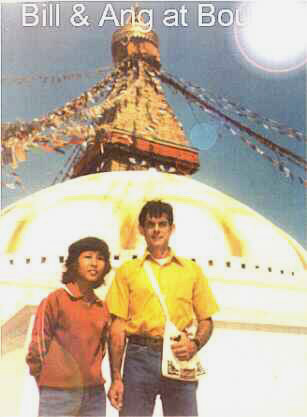 It did not seem fair so I joined the Peace Corps as a volunteer, and traveled to Nepal in that capacity. It took about two minutes off the plane at Tribhuvan to realize that what Nepal needed most was some employment opportunities and a few Yankee dollars. A failing kidney cut short my tour of duty in the Peace Corps, but after surgery and recovery in the US, I returned to Nepal as a private citizen determined to accomplish my mission of learning more of Buddhism and finding some way to achieve my goal of returning something to Nepal in exchange for my lessons in Buddhism. I met Yangdu and we were married. I found the answers I was seeking and became a Buddhist. I searched for a way to help the Nepali people. Finally, I decided to try one of the few things the Nepalis could manufacture -- the khukuri. 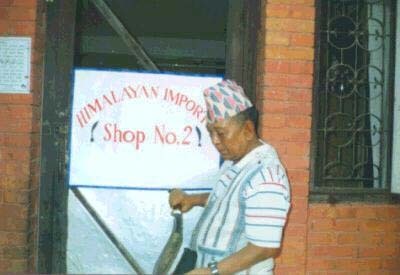 Himalayan Imports (which should have been Himalayan "exports") was born. At first we tried to deal directly with individual kamis such as Nara but found this gave us no real product line and gave us problems like scabbards. Just because a man can make a decent knife does not mean he can make a decent scabbard. And, the handles were often only four inches, made for Nepalis. We kept working. I started to run ads in knife magazines and other appropriate spots and found they were very expensive. I had to set the price of my khukuris high to try to cover ads and operating cost. I had the reputation of the junk kukri from India to overcome. I sent knives to magazines and newspapers here and abroad hoping for exposure. Just trying to stay alive was a major problem. 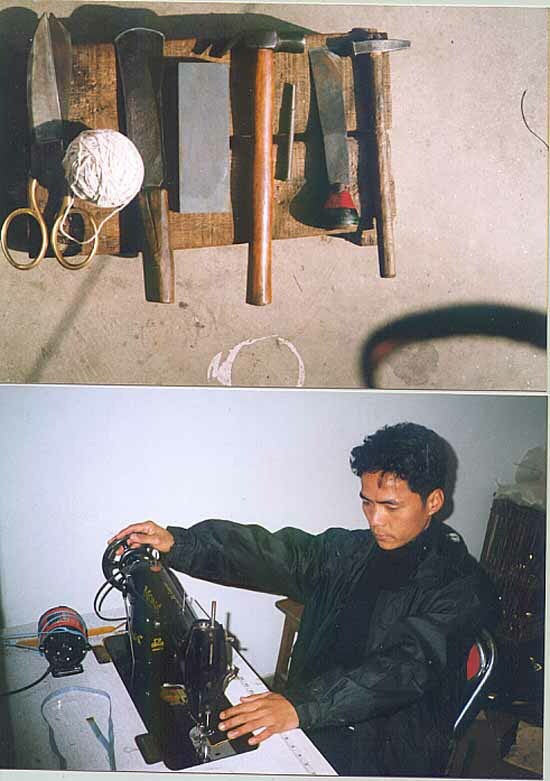 In Nepal, we were searching for a way to standardize our khukuri. We discovered a shop in southeast Nepal that was making khukuris for the tourist market, down and dirty cheap, but the operator was capable of making a high quality khukuri to our specs. So, we made a paca, a deal. We would try a joint venture, making a top quality khukuri with a decent sized handle aimed at the US and world market. We would make the best that could be made and pay the price -- and this is what we have done. The more we sold the more I advertised and promoted, keeping the price of the khukuris steady. I gained customers and soon many of my sales were repeat orders. Our khukuris began to attract attention and a magazine article would pop up here and there. My legwork began to pay off and we started receiving orders from foreign countries -- not many, but some. More articles and the word began to spread. We started to show a profit. We made more khukuris back in Nepal, giving employment to those that needed it most. And, after five years of struggle we were showing a profit. I received offers from major manufacturing houses in India and Pakistan who could make a khukuri of equal quality for a lower cost. I turned them down, telling them this would be like taking the food off my own family's table. We made a khukuri for the Canadian Army Museum which was rated the best in their collection. About 25 of our khukuris were donated to the National Knife Museum in Chattanooga by Dr. Bill Rosenthal of New Orleans. More articles. About a year ago and at the cost of a bleeding ulcer I bought a computer and got on the net. In the last couple of years we have had good press. This may not seem like much to the big boys but to date I have invested about $50,000 in advertising and promotion and have untold hours of time invested toward making this business work. I have bent over backwards to offer the best customer service that I can. In Nepal the kamis have sworn at me because I would ask for the "impossible." It has not been easy but I am proud of our effort. Although I have no way of proving this I am of the opinion that our years of struggle and effort have inspired US manufacturers to introduce khukuris as part of their product line and others to import khukuris and offer them. When Yangdu was a young girl and used to travel to India to visit relatives she would ride what is called the "night bus." 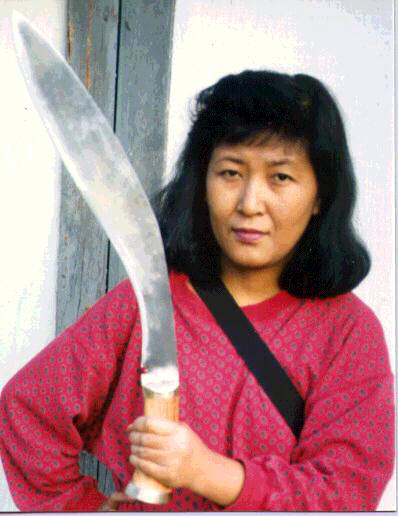 The male passengers would often try to become amorous with female passengers during the darkness of night so Yangdu would always tape a small 9 inch khukuri to the inside of her thigh. 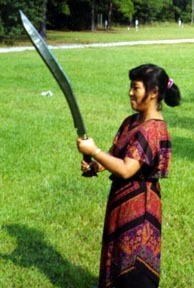 If she was approached she would reach under her anghi (long Sherpa dress) and whip out her little khukuri. Her stock phrase was, "if you want to keep that hand then keep it off me." Rajkumari is the wife of Vikash, Bandana is 7 year old daughter. 3 year old son, Denny, will not stand still long enough for picture. This is typical Nepali kitchen for city dwellers. Vikash has home in Bagh Bazaar, the quarter where Yangdu and I had our first apartment in 1984. Propane range, no oven. Water is hand carried from outdoor faucet. (White water buckets). Water must be boiled and filtered. Notice filter on shelf just left of Yangdu. Gelbu is Kami Sherpa's son and a shop manager at BirGorkha. In the photo, Gelbu and gal pal, Deena, are having a cup of tea. Deena is of the Newari caste. Both her father and mother are engineers. 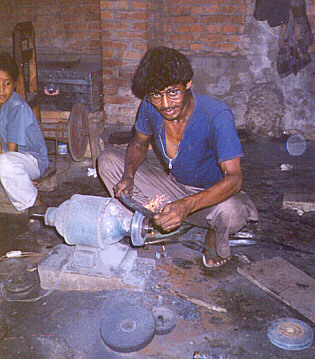 (above) Govinda and Ashok (at the sewing machine) making HI superfrogs. 'Here's a pix of our village sarki, Prakash, at work. By the looks of it he can chuck quite a bit of wood. The gal looking on is Pradeep's wife, the very nice looking kamini, Rewoti. 'Here are Rabi, right, and Bhani, left, doing the silver work for a kothimoda. You can see the partially completed scabbard on the little table. They are working in their BirGorkha apartment above the shop. As you can see the apartment in not the Waldorf Astoria but it is better than a lot of places I've stayed in Nepal. On the small table and floor are the tools of the trade for silversmithing -- torch, mini forge, hammer and some small dies and tools. Of interest to the old and regular forumites is Rabi, the oldest son of Murali, the kami who had to give it up because of tuberculosis. 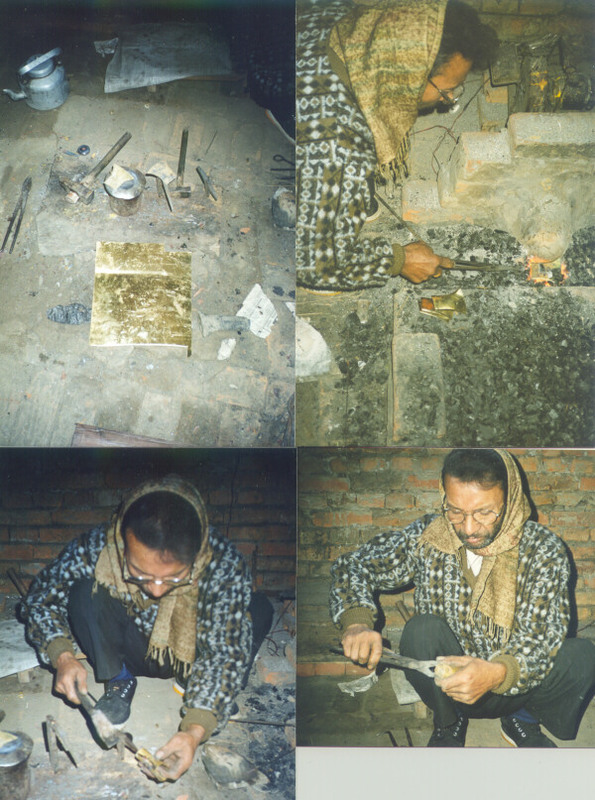 This young man belongs to the Newari caste that does carving. It is in their genes and it shows. He does excellent work and is a frequent visitor to BirGorkha. His home is just a five minute walk so it is very easy for him to drop by, ask questions, and then resume his work. He is a very nice young man and I liked him a lot. in their own advertisements to pawn off lesser-quality khukuris on unsuspecting consumers! Please inform us if you discover illicit use of our content.